As the scarcity of Earth’s natural resources worsens with increased consumption, the focus usually falls on natural gas and oil reserves, causing many to ignore the growing shortage of the world’s third most used natural resource – sand. Sand is one of the key ingredients used in construction in the modern world and is used in the production of glass, computer chips, computer screens, and, possibly most importantly, concrete. With rapid infrastructure development in nations, particularly across Asia, the production of concrete, which consists of 75% sand, has depleted natural reserves and led to tensions between international actors. China alone consumed more concrete between 2011 and 2013 – an estimated 6.4 gigatons – than the United States did during the entirety of the twentieth century. Due to the high demand for sand and disputes caused by the industry, international tensions between actors have arisen wherein nations with weaker environmental regulations are often more susceptible to exploitation by extra-legal actors. 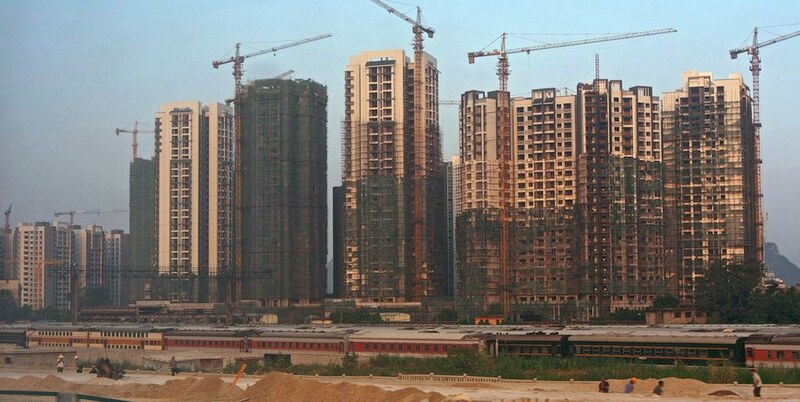 China’s newly built cities require massive amounts of concrete. Geopolitical tensions caused by the global sand shortage are not the only downsides to the sand market; sand extraction is also quite harmful for local ecosystems. In the construction world, not all sand is created equally. While deserts appear to be endless seas of sand reserves waiting to be harvested, desert sand is unfit for use in products like concrete. Due to heavy winds and the erosion of desert sand, these grains have become too round to be used in the production of concrete without risking structural strength. The optimal type of sand is found in riverbeds and oceans, meaning that extraction is both difficult and damaging to marine ecosystems. The rougher composition of aquatic sand allows for stronger concrete, which is essential for nations investing in massive infrastructure development projects. Due to the heightened demand for aquatic sand, many nations with short supplies are forced to import the fine substance. Even Dubai, a city essentially surrounded by nothing but sand, had to look abroad when constructing some of their most famous attractions. 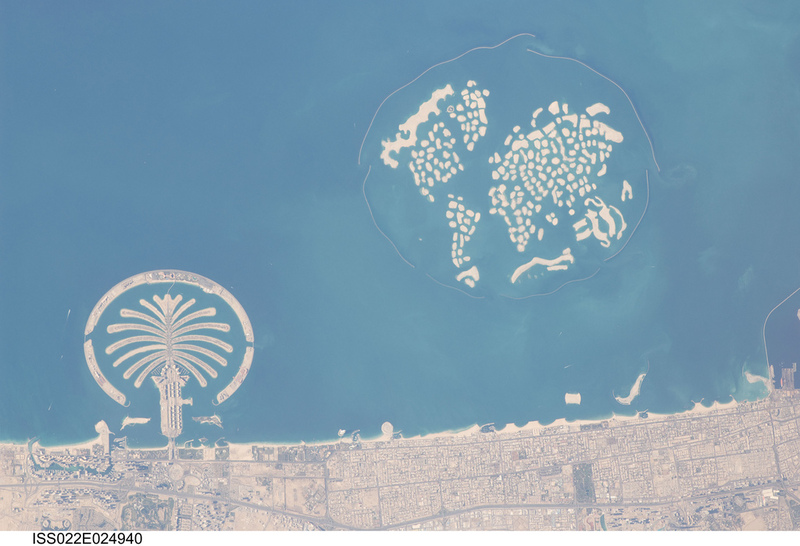 After depleting a majority of the United Arab Emirates’ ocean sand reserves during the construction of the palm and world islands, Dubai had to turn to Australia to import enough sand to build the Burj Khalifa. Now, the United Arab Emirates has become one of the largest importers of sand with an estimated 456 million USD spent on sand in 2014 alone. While sand is overwhelmingly used in the construction of concrete, the depletion in sand reserves is also due to its uses across other developmental projects, such as land reclamation. Land reclamation, the process of placing dredged sand into the sea to expand land borders, has been a massive consumer of ocean sand in recent decades. While it may sound fictitious, entire islands have disappeared at the hands of nations seeking to artificially expand their borders. While Singapore underwent a massive land reclamation project that grew the island by roughly 22% of its original area, nearly two dozen uninhabited Indonesian islands vanished from the ocean. Since the disappearance of these islands, Indonesia, once Singapore’s biggest supplier, as well as Vietnam, have fully banned sand exportation out of fear of irreversible environmental damage. However, the demand for sand continues to increase even amidst tightening regulations and, thus has arisen a thriving global black market for sand. With nearly four billion tons of concrete constructed and used on an annual basis, the amount of global sand supply is rapidly running out. This has led to the emergence of a black market dedicated entirely to the illegal buying and selling of the natural resource. 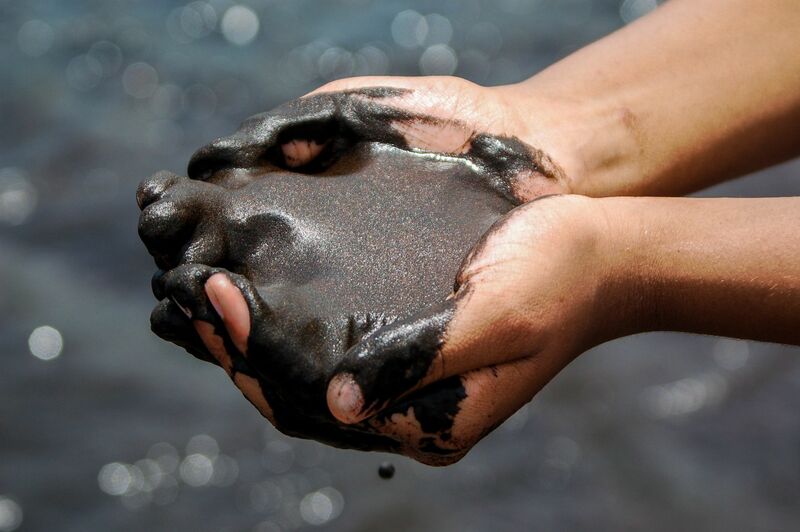 This black market flourishes primarily in developing nations by exploiting weak environmental protection policies and engaging in corruption. Evidence of beaches disappearing overnight supports the notion that sand extraction is increasingly being performed via extralegal practices. In India, the world’s twenty-ninth largest exporter, the black market for sand generates an estimated 2.3 billion USD a year, which allows the country to employ a larger number of citizens who, otherwise, due to the high rates of unemployment, would be without work. With the growing influence of the black market in India, an illegal group dubbed the “Sand Mafia” has grown to become the nation’s largest criminal organization. 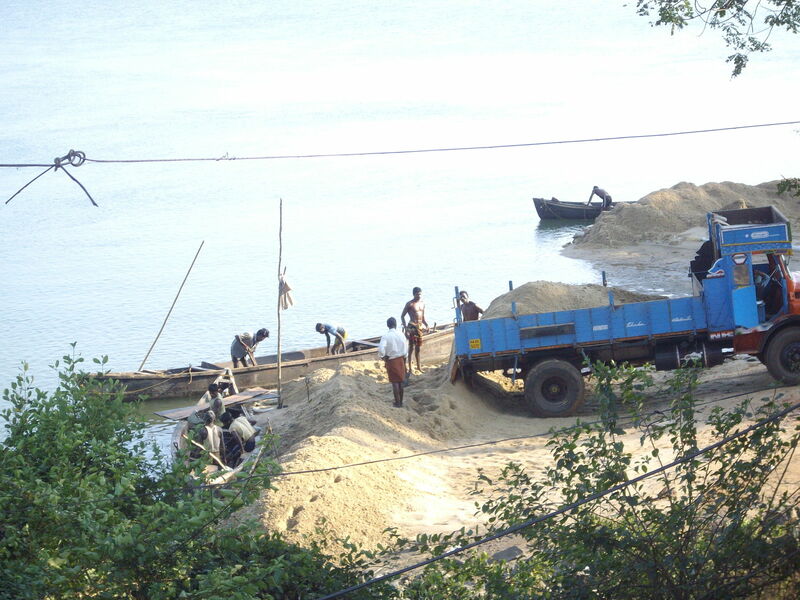 By operating illegally, the “Sand Mafia” can circumvent any mining regulations, such as having to pay royalties to the government on mined sand. 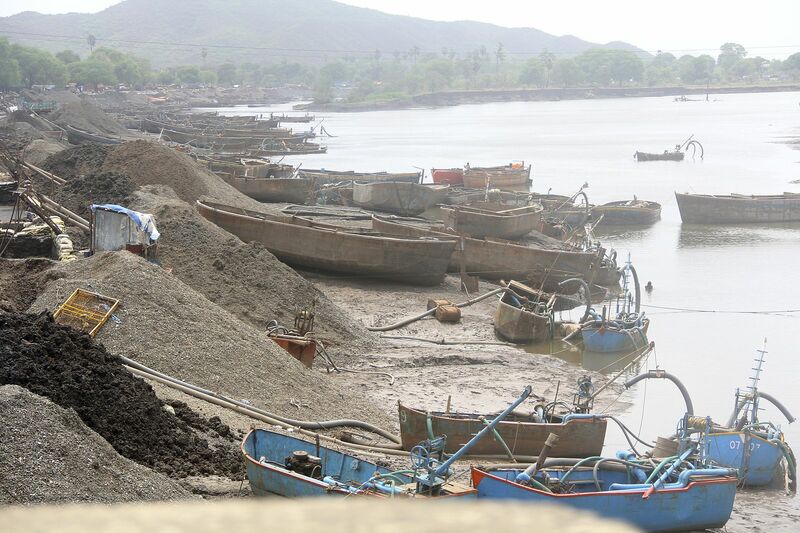 With sand prices expected to rise in the near future, the demand for illegally mined sand is high, thereby allowing illegal cartels such as the “Sand Mafia” to continue to operate despite their, often immoral, practices. Evidence of the “Sand Mafia” violently silencing innocent villagers simply for protested the illegal extraction of sand corroborates the idea that very little is being done by the government to dismantle or stop this group. Suction pumps may run day and night to quickly strip rivers of their sand. Sand mining is responsible for producing 70 billion USD on an annual basis and its economic viability means that reformation will de difficult. However, some kind of change must occur before the Earth’s aquatic sand supply is completely depleted and more marine ecosystems are destroyed. A report by the United Nations Environmental Program attributed a lack of global awareness on the severity of the sand shortage as a key reason for why so little has been done. Sand extraction should be viewed in terms of the global aggregate rather than the regional scale to depict more accurate effects of the mining. Furthermore, the United Nations Environmental Program proposed that a better taxing and pricing system should be developed to regulate the sand trade so as to avoid the exploitation of developing countries. The onus of dealing with the sand shortage should not only fall upon developing nations because, in most cases, these are the nations that are already being exploited. While stricter environmental regulations to prevent heavy mining are needed, they must be met with ancillary research into alternatives to concrete so as to satisfy the demands of the global construction market. Methods of artificially creating sand through grinding up glass bottles or recycling concrete, while expensive, should be popularized as innovative construction techniques. The militarization of the sand industry highlights a growing need to find a more sustainable alternative. While this rhetoric may be dismissed as idyllic, finding more sustainable alternatives to sand as well as normalizing less ambitious and more realistic infrastructure development projects will abate the growing problems arising from sand extraction. Sand is not something that individuals should be killed for but, unfortunately, this is increasingly becoming the case. The black market for sand and the extent of the ramifications of the mining industry should not remain hidden from the public; this is a global issue that must be met with a global response if effective change is ever going to be realized. Brian McGinn is a U2 student currently pursuing a degree in urban studies. Originally from suburban America, he is particularly interested in urbanism and sustainable development in East Asia and abroad. When Brian isn't writing from MIR, you can probably find him trying to find a decent cup of coffee or in line at Soupe Café about to buy his 4th grilled cheese of the week.